What's New in Accounted 4? Accounted has been around since 2007. Eight years. Many users, including us here at Oranged Software, have been using Accounted that entire time. Entering transactions and people and accounts every day or week, slowly adding to a growing database. Because of this, we had several users request the ability to split data files into fiscal years. This would speed up loading times and reduce clutter from old transactions. The problem with that, though, is you wouldn’t have your entire accounting history in one location. Opening and managing files for each year is tedious and defeats the purpose of having fancy accounting software. With Accounted 4, we engineered a way to have the best of both worlds. 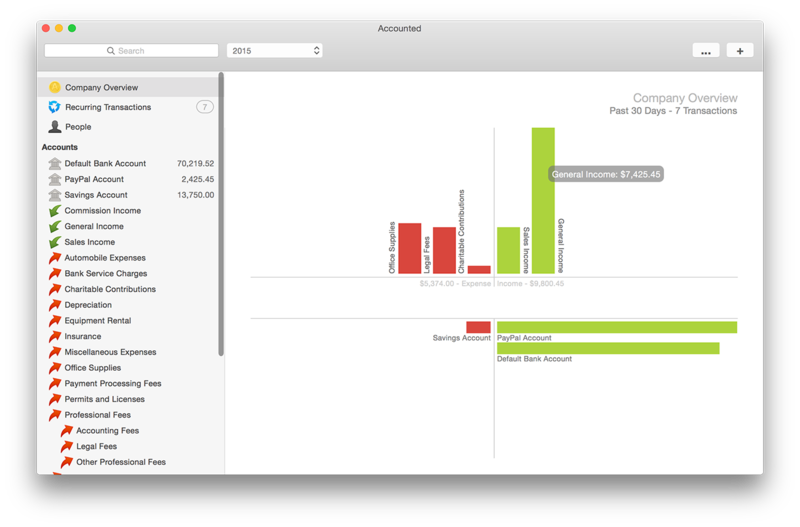 Accounted does some behind-the-scenes magic to split your data into fiscal years while still keeping everything in one file. So what does this actually mean? Accounts load way faster. Transactions and balances are calculated almost instantly. You can “load” a specific fiscal year, or show your entire account history. And you won’t need to manage a separate file for each year. Now when you launch Accounted, you’ll get a quick snapshot of activity over the past 30 days. You’ll be able to see a visual representation of the top income and expense accounts, and the changes to balances in your bank accounts. A benefit to keeping all of your data in one place is searching through all of it at once. Easily search your accounts, transactions, and people using the new search field at the top of Accounted’s main window. 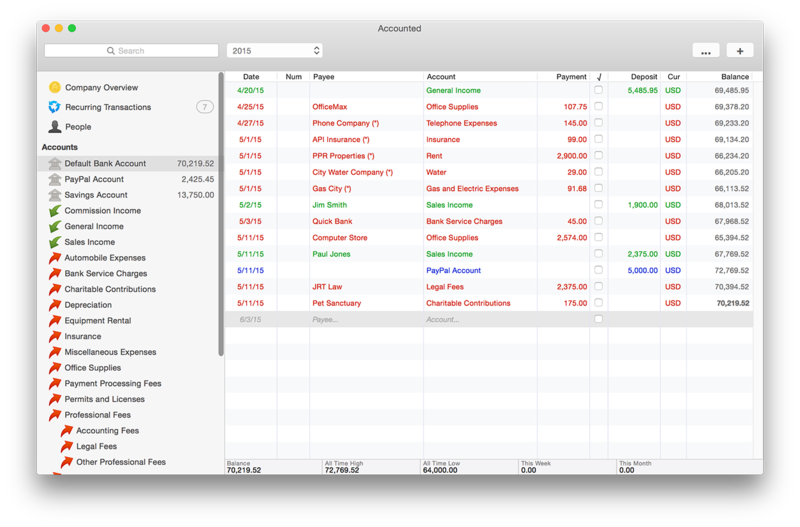 Accounted 4 has a cleaner, sleeker interface inspired by Yosemite. Translucent cues, vibrant icons, and less clutter make Accounted 4 as pretty as it is powerful. Accounted 4 looks amazing on computers with high resolution displays, such as Retina MacBook Pros or the new iMac 5K. All of the icons and windows have been updated to take advantage of these beautiful displays, making text more readable and graphics crisper. Check the version history for the full list of updates.